Pilots and cabin crew have come to blows on an international flight bound for India, media reports say. The scuffle is said to have begun as an argument in the plane's cockpit over claims of sexual harassment but spilled into the galley, startling passengers. A pilot and a flight attendant suffered bruises as punches were thrown. Indian police are investigating the incident, which took place at around 0430 local time on Saturday (2300 on Friday GMT). The cabin crew alleged that pilots sexually harassed a 24-year-old female flight attendant, who filed a complaint once the plane landed. But the Times of India newspaper said the pilots made a counter-claim, saying that the harassment claim was an attempt to divert attention from accusations of misconduct against a male flight attendant. 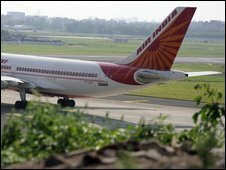 Air India said it had ordered an inquiry into the incident, and had grounded all the staff involved.